Speaker Martin Laschkolnig - Talks about Self-esteem and Success! Our keynote speaker Martin Laschkolnig is founder of the Institute for the developing of potential in Austria. He addresses ‘The Success Principles’ and help audiences all over the world succeed in all aspects of life, both personal and professional. Martin and his wife promote and emphasize the importance of self-esteem and confidence in order to help people live up to their potential. Martin Laschkolnig is the founder and director of the Institute fuer Potentialentwicklung (Institute for the developing of potential) in Linz, Austria. 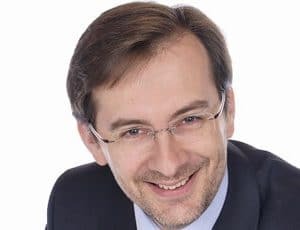 He is a director of the board of the German Speakers Association (GSA), President of the Austrian Chapter of GSA and the first member of GSA ever to speak at an NSA Convention. As the European partner of Jack Canfield he is speaking and training ‘The Success Principles’ in German and English all over Europe. He helps his clients and seminar attendees to experience these unique principles that will help anyone who applies them to live a fulfilled life – in all areas. Professionally, in relationships, finances, contribution to society, in health and fitness and the spiritual sphere – in short: more money, more free time and more fulfillment in life (or all three for those who don’t want to wait 😉 – so that you can live the life you want and also have the resources to do so. Combining a business education and entrepreneurial background with years of studies in Buddhist Philosophy and Theory of Perception with Tibetan monks in India led to a new and different approach to view and solve our problems. Together with his wife he built the Helen Doron Early English Franchise in Austria to be the distinct no. 1 early education franchise in the Austrian market. Since 2003 Martin Laschkolnig and his wife Monika are representing the International Council for Self-Esteem in Austria. The Council is a worldwide not-for-profit organization dedicated to the promotion of the importance of self-esteem and self-confidence for everyone in our societies, from infants to adults. Everybody talks about success – but what is it really? The Success Principles compiled by one of the leading American success experts Jack Canfield are the result of more than 35 years of research as to what it really takes to be successful – in all areas of your life. Martin is Jack’s official representative in Europe and will deliver the most important principles in an inspiring and activating keynote presentation that will leave your audience engaged and ready to take life on. Inspirational stories, universal principles of success and hands-on practical strategies are combined into a presentation that touches the heart and ignites the desire to make things happen. These principles are proven over time and more relevant in these times of change and crisis than ever. Engaged employees are the secret to the success of your enterprise today and will become the one key factor over the next few years. You can buy people’s time but not their engagement. And with baby boomers dropping out of the work force in an ever increasing speed what will you do to keep your employees and attract the people that you will desperately need? Martin’s presentation shows you that with your focus on five areas you can create an environment where people will be active ambassadors of your company. They will not only not want to leave but they will open their hearts and minds to new levels of innovation and creativity. They will have a fantastic time while they are reaching new levels of excellence for your company. With these 5 steps you can build an environment where people will engage with high self-esteem, mutual respect for each other and loving to move mountains together. The law of attraction is not wishful thinking, but one of the most powerful laws in the universe. Like attracts like but still many people are struggling when they try to apply it. Martin will give your audience a sense of empowerment and possibility in this engaging and inspiring keynote program. Most of our perceptions are shaped by subconscious patterns and Martin will show your audience the psychological basis of how it works and how you can change it. As long as we are still not 100% in the flow of possibility and ease, will power and perseverance have their merits. But even more important is to take a bit of the time spent in the rat race and make room for working on the underlying structure of our habitual patterns. And instead of you fighting your way uphill to accomplish your results you will be able let live will pull you towards them. Life can be a joyous dance of co-creation. Let your audience be inspired to more results while having more fun achieving them. Life isn’t getting any slower any time soon. Stress levels rise to unknown heights, burnout and depression will be the new cold in 2020, rising to the second most common disease only surpassed by the flu. What if there was a process that was safe and easy to apply that would help your people to let go of overwhelm, stress, anger and frustration within minutes? Well there is. A special technique from the field of energy psychology called Meridian Tapping allows people to use 8 body points and an 80 second process to reduce stress levels or other negative emotions by 80% or more, often within minutes. It allows people to be emotionally free, break through professional or private blocks that keep them from living the life they truly want and gain true emotional freedom. This process can help your sales team to let go of the emotional stress caused by encounters with difficult clients and be ready and fresh for their next sales call. It can help your management team to negotiate powerfully and without inner attachment or resentment from past meetings. It can help reduce procrastination and help people to focus on the tasks at hand. Martin will teach this process in a fun way with practical exercises, so that everyone in the audience leaves with a hands-on experience of what this process can do for them. Titles and content can be adjusted for each client.